Divisional Analysis has been a part of Fathom’s toolkit for many years. With these features, we’ve empowered advisors & business owners to easily gain insights into the performance of the divisions, departments, locations, profit centers, cost centers or any other segments within the business. We’re excited to announce that you can now add a Division Summary to your custom reporting in any company that has tracking categories, locations, or classes imported. With our new side-by-side divisions in reporting, you’ll be able to keep an eye on the performance of all your divisions in a single report. In the Division Summary, you’ll be able to show all of your divisions at once, or select specific divisions to show in your tables. You’ll be able to use a Division Summary table across all of the Fathom financial statements including Profit & Loss (Income Statement), Balance Sheet and the Cash Flow Statement. Along with this compelling high-level view of how your divisions are performing, we also wanted to help you quickly understand how your results break down across your divisions. That’s where our new Divisions Drilldown comes in! We’ve added the ability to dive even deeper into your financials to see a divisional breakdown of your individual accounts. 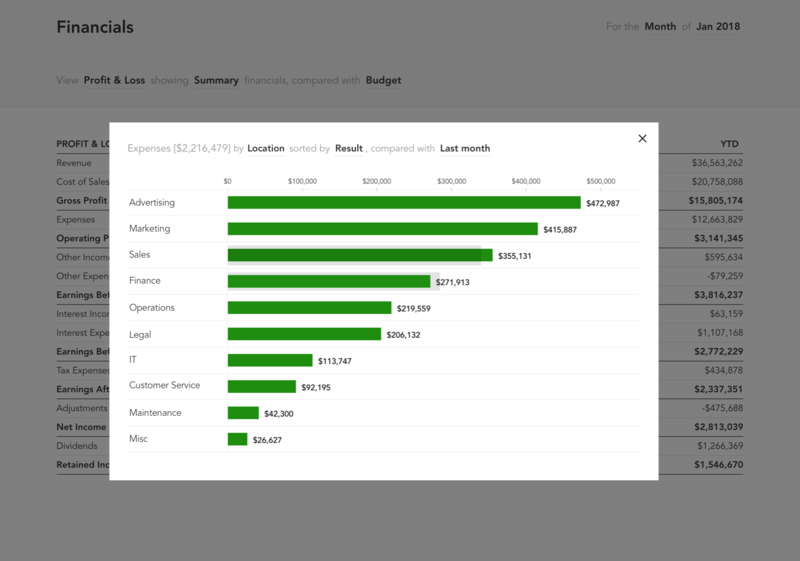 When viewing your financials, you can now click on any row to reveal a helpful breakdown of that metric across your divisions. For further insights, sort your divisions by result or by alphabetical order. You can also compare results against last month, or same month last year. We'd love to hear your thoughts and feedback. If you have any questions please email us at support@fathomhq.com.